Discover your discipleship blind spots, make more disciples. Pastors tell us that once they recognize where they have a blind spot, they typically have the tools to address any problems they find. Either they have been focusing their attention in the wrong areas or something was blocking their view of the congregation. The TDA is designed to help bring clarity to those blind spots. When the congregation tells you about their lives as disciples, you gain insights on how to address their spiritual needs. This helps in the practical decision making you face every day. One pastor, new to his church, found the people to be a very warm, welcoming, and devoted body of believers. After about a year as pastor, he was encouraged that several new families had been visiting during Sunday mornings. However, the pastor was growing frustrated that a few of those newer and younger families weren’t connecting with any small groups. What was missing? He was more than a little afraid that despite how much these new families said they enjoyed worshiping at the church, they wouldn’t ever really settle in to the church.. Walking his church through the TDA helped him see that his blind spot had been that the church was friendly with one another but not intentional about connecting with the new families. 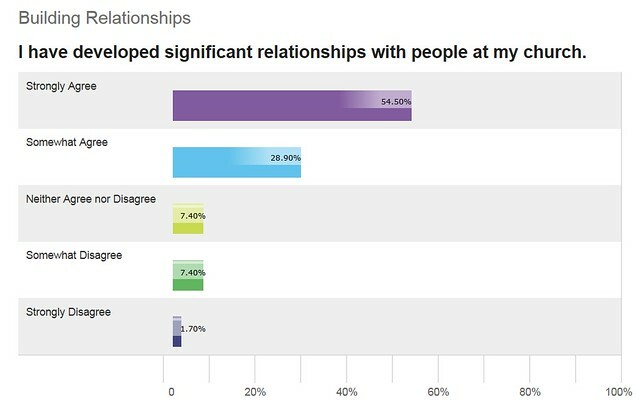 In his detailed report, he could see that in “Building Relationships” (one of the 8 discipleship attributes in TDA), he could see the difference. 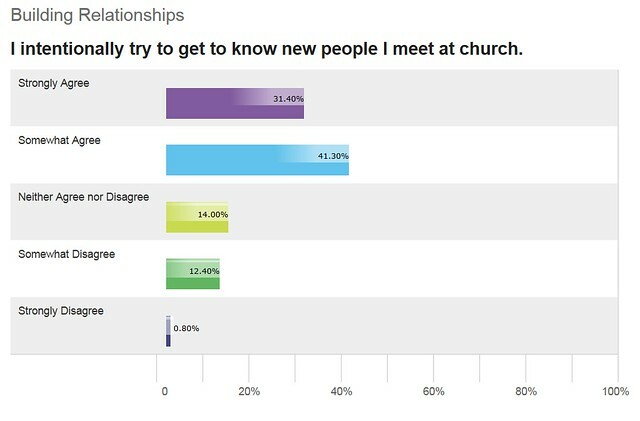 The vast majority of his congregation valued the relationships they had in the church. But it was clear in the detailed report that they were not, as a church, intentional about connecting with the newer families. Seeing these two charts (and the others) helped the pastor find the clairity he needed to begin work on his next sermon series on the biblical principles and practical application of community in the life of the church.